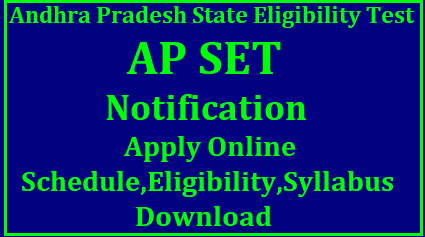 Andhra Pradesh State Eligibility Test (APSET) is conducted by Andhra University, Visakhapatnam on behalf of Government of Andhra Pradesh to recruit Assistant Professors or Lecturers in the state of Andhra Pradesh. Informing the same, the official website of APSET states: “In view of lot of demand for recruitment as assistant Professors / Lectures through direct recruitment or promotion in Universities and Degree colleges in newly formed Andhra Pradesh state, Andhra university prepared the proposal for conduct of APSET examination and sent it through APSCHE and Government of Andhra Pradesh to the U.G.C New Delhi”. Before submitting the form check all the details and click on the submit button. Candidates who have secured at least 55% marks (without rounding off) in Master’s Degree or equivalent examinations from universities/institutions recognised by UGC are eligible for this Test. The Other Backward Classes(OBC) belonging to non-creamy layer/Scheduled Caste(SC)/Scheduled Tribe(ST)/ persons with disability(PWD) category candidates who have secured at least 50% marks (without rounding off) in Master’s degree or equivalent examination are eligible for this Test. Candidates who have appeared or will be appearing at the qualifying Master’s degree (final year) examination and whose result is still awaited or candidates whose qualifying examinations have been delayed may also apply for this test. However, such candidates will be admitted provisionally and shall be considered eligible for qualifying the test only after they have passed their Master’s Degree examination OR equivalent with at least 55% marks(50% marks in case of OBC(Non- creamy layer)/SC/ST/PWD(persons with disability) category candidates. Such candidates must complete their P.G degree examination within one year from the date of SET result with required percentage of marks, failing which they shall be treated as disqualified. Candidates are advised to appear in the subject of their post graduation only. The candidates, whose post graduation subject is not covered in the list of subjects may appear in a related subject. Candidates having post-graduate diploma/certificate awarded by Indian University/ Institute or foreign degree/diploma/certificate awarded by the foreign University/institute should in their own interest, ascertain the equivalence of their diploma/degree/certificate with Master’s degree of recognized Indian universities from Association of Indian Universities (AIU), New Delhi. Search the admit card link on homepage & Open it. You will receive a request with boxes. APSET Exam Admit Card will appear on the screen. The counselling will be held only for the candidates who qualified the APSET 2018. A merit list will be prepared and call letter will be sent to them. Candidates who received the call letter only will be able to participate in the counselling procedure. APSET 2018 counselling process includes document verification and seat allotment. Candidates who are going to participate in the counselling procedure must carry the original certificates with at least two sets of photocopies.